Consumers want to feel secure about making a purchase, and I don’t mean encryptions and data protection (although that is important). Feeling that you made the right purchase, and making sure you won’t have buyer’s remorse is an important part of the buyer’s journey. But knowing how others felt about a purchase, or their intent to purchase can be a powerful motivator — which is exactly why reviews and testimonials are some of the most valuable forms of content you can have for your website as they help to build trust and confidence. 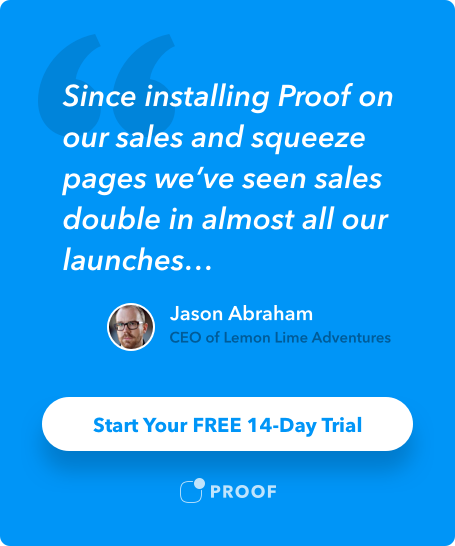 This type of social proof can dramatically improve your user experience and, if powerful enough, potentially shorten your sales cycle. In this article, we’ll take a look at why social proof is important and how utilizing three different types, you can dramatically improve your user experience and buyer’s journey. Social proof isn’t a new concept. Dr. Robert Cialdini actually talks about it being one of six influencing principles in his marketing book, Influence: The Psychology of Persuasion, first published in 1984. But bringing it into the digital age via websites, video, and experiences is a new spin on an old phenomenon. When you really stop and think about it, so many of our online habits are informed by social proof. The last time you went onto Amazon, or another eCommerce site, you likely looked at reviews, ratings, and other pieces of social proof before you made your purchase. As a brand, it’s become the standard to have this type of information to support that your product is what you say it is. Amazon and other sites have even started to verify and validate frequent reviewers — giving their social proof more credibility. They’re that important. Example of Verified buyer from Floyd. Over the last few years, there have even been a few studies that have given us some very interesting stats around social proof. For instance, a 2016 Nielsen study found that 82% of Americans say they seek product recommendations from friends and family before making a purchase. That same study also found 86% of Americans with a household income of more than $100,000 seek recommendations when considering a purchase. These are some very powerful stats that make it very clear how much of an impact social proof can have on your brand. By embracing this part of the buyer’s journey and making this information easily accessible, you can actually improve the user experience on your website. Bringing your reviews, good and bad, to the forefront helps your user do less research and they’ll actually trust you more because of it. Yes, I said even the bad reviews! While your first instinct may be to delete or downplay bad reviews, they can actually serve a higher purpose if you address them publicly and “make good” by the customer. Think about your own buying habits. If you’re researching a purchase, and you can’t find reviews — how long does it take before you leave that site and go to a competitor? By leveraging social proof, you not only streamline the buyer journey and build trust, but you give the audience an experience that can actually make shopping enjoyable. All that being said, let’s take a look at a few specific types of social proof that can help you improve the user experience on your website. Helping your audience feel confident in their purchasing decision is key to remarkable user experience — and that’s exactly where social proof comes in. Social proof on websites typically takes the form of three types: Testimonials or Reviews, Case Studies, and Instant Social Gratification. A 2018 survey done by BrightLocal found that 91% consumer trust online reviews as much as personal recommendations (in the 18-34 year old age bracket). That stat says a lot about the power of social proof. The overwhelming majority of users use reviews and testimonials to inform their purchasing decision. Typically shown with the person’s name and title, and sometimes with an accompanying picture, testimonials can provide immediate value for the user when browsing your website. Text testimonials, like the one above, can be extremely beneficial, but if you want to provide an even more human element to your social proof, you can opt for a video testimonial. Video testimonials, like this one from Salesforce, give you the opportunity to actually show some of the work that was done — or provide a more human view into your brand or customers. The visual appeal can help keep users engaged and help them to really understand the value you provide. Case studies are a great way to illustrate deeper, data-backed value than a simple testimonial or video. They typically dig into the problem the customer was facing, how your team or product was able to solve for it, and ultimately the results and ROI they received. Due to the more in-depth nature of case studies, this type of asset typically signifies that your user is a bit more sales ready than someone simply browsing your website looking at reviews and testimonials. This type of social proof could be created in a few ways. The most popular is in a PDF placed behind a form so that you can see who is downloading and viewing them. They are a great starting point but don’t provide a ton of value for the user who may be form-adverse. At IMPACT, we’ve seen a lot of value in creating our case studies as long-form content including video so that the user has no obstacles to viewing the content. The long-form content route also helps generate some great content that can be indexed by the search engines and can segue nicely into a bottom-of-the-funnel offer. Similar to testimonials and reviews, case studies are great for building the user’s trust in your offering — letting them get educated on their own terms and ensuring they feel confident in the buying decision. Because case studies typically dive deeper into the use case, they also show more value to the user in the form of what return on investment (ROI) actually was generated. ROI can be actual revenue generated from a tool/service, or simply just an amazing experience from using your product. Instant social proof is relatively new, but it can yield amazing results for your user experience. Companies such as Hotels.com have begun implementing notifications that let the user know how users are interacting with specific pieces of content. The above example shows the notification I received while looking at hotels in Toronto — informing me that a room was booked exactly three minutes ago. Showing these interactions can help foster a deeper level of trust in what your users are viewing and doing. Displaying things such as views over a period of time, recent conversions, and how many people have purchased can potentially alleviate any concern the user has, and get them to convert faster. It leans heavily on the group mentality. After all, if others are doing it I can trust it and I should be doing it as well. Right? Tools such as Proof, make those types of notifications extremely easy to setup, track, and optimize for your specific user base. We recently installed Proof on our event site for IMPACT Live, and the initial tests show that utilizing instant social proof increased our conversion rate by 1.86% (and that’s only after 4 days of usage 😊). Experiment with instant social gratification on your downloadable offers, product pages, and even on your consultation or demo pages to show that others in your audience are engaging with the content. One of the easiest ways to improve your buyer journey and user experience is through social proof. It helps to answer one of the basic questions your prospects likely have — can I trust this product or service? By utilizing a combination of the above social proof types on your website and in your buyer journey, you’ll create an experience that makes them secure in their buying decision, and can even shorten your sales cycle.